14" wide foot. Used for packing gravel and pavers. When using with pavers leave a layer of sand over the pavers. We also have paver pads available (only on the 200 lb tampers) for the type of pavers that need protection between the tamper and the paver. 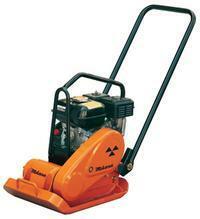 We also carry a roller tamper that is specifically designed for pavers that may break or chip. * Please call us for any questions on our 140 lb 14 inch plate tamper rentals in Calgary, Alberta.